Why buy Transceiver Modules from the IT Help and Support Centre? Do you offer a warranty on your Transceiver modules? What if I don’t see the transceiver module I’m looking for on your site? What is a hot-swappable device? What are the main types of Transceiver Module? What are the differences between Multi-mode Fiber (MMF) and Single-mode Fiber (SMF)? What are the main types of Gigabit Ethernet? What are the main types of 10 Gigabit Ethernet? Why would I use a Transceiver Module? What equipment do I need to install a Transceiver Module? What are CWDM and DWDM ? What should I be aware of before installing or removing a Transceiver Module? How do I install an SFP Transceiver Module? How do I remove an SFP Transceiver Module from my device? How do I install a GBIC Transceiver Module? How do I remove a GBIC Transceiver Module from my device? How do I install a XENPAK Transceiver Module? How do I remove a XENPAK Transceiver Module? How do I Install an X2 Transceiver Module? How do I remove an X2 Transceiver Module from my device? How do I install an XFP Transceiver Module? How do I remove an XFP Transceiver Module from my device? What is an RJ-45 Connector? What are Category 5, 6, and 7 Copper cables? What are LC and SC connectors? What is a Duplex communication system? What does the “/PC” after the connector type refer to? What is a 'Rugged' (RGD) Transceiver Module? Can you connect a GBIC to an SFP ? A transceiver module is a self contained component that can both transmit and receive. A Transceiver is the combination of a transmitter and a receiver into a single device. Furthermore, transceiver modules are hot-swappable I/O (input/output) devices which plug into module sockets. The transceiver acts to connect the electrical circuitry of the module with the optical or copper network. Devices such as routers or network interface cards provide one or more transceiver module slot (e.g GBIC, SFP, XFP), into which you can insert a transceiver module which is appropriate for that connection. The optical fibre, or wire, plugs into a connector on the transceiver module. There are multiple types of transceiver module available for use with different types of wire, fibre, different wavelengths within a fibre, and for communication over different distances. We guarantee the compatibility of all of our transceiver modules, and always ensure that they meet or surpass the standards set by the manufacturers of the devices in which they are intended for use. Our customer support operatives are equipped with specialist knowledge of all of our products, and can advise you on the correct transceiver module to meet the requirements of your network. If you need advise on transceiver modules, or have any questions Contact us and one of the team will get back to you shortly. Yes, we offer a lifetime warranty on all of our modules unless otherwise stated. In the unlikely event of a fault please contact us and we will assist you in getting your replacement as quickly as possible. If you can’t find what you’re looking for on our website please let us know. We not only supply compatible products, but also manufacturer’s originals. A hot-swappable device is one which can be connected or disconnected from an electronic device without having to reboot. This is useful as it allows you to swap between transceiver modules without having to power off your device. Gigabit interface converter (GBIC) : 1 Gigabit Ethernet. 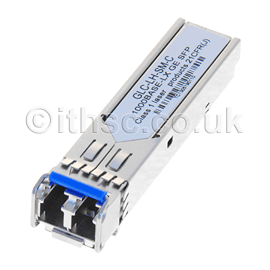 Small form-factor pluggable (SFP) : 1 Gigabit Ethernet, also known as the Mini-GBIC. 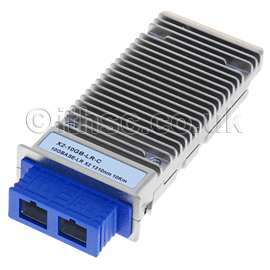 Small form-factor pluggable (SFP+) : 10 Gigabit Small Form Factor Pluggable. XENPAK : 10 Gigabit Ethernet. XFP : 10 Gigabit Small Form Factor Pluggable (slightly larger than the SFP+). X2 : 10 Gigabit Ethernet. Quad Small Form-factor Pluggable Plus (QSFP+) : 40 Gigabit Ethernet. C Form-Factor Pluggable (CFP) : 40 - 100 Gigabit Ethernet. Both MMF and SMF are a type of optical fibre, a very thin strand of silica (glass), which enables the communication of devices by the transmission of light between each end of the fibre. Fibre optics are advantageous, as they allow for transmission over long distances (up to 100km) and at high data rates (up to 100 Gbit/s). This is because their signals are subject to less loss than metal wires, and they are not affected by electromagnetic interference (EMI) which can reduce signal quality. Simply put Single-mode fibre (SMF) can carry a single beam of light, while Multi-mode Fibre (MMF) can carry multiple beams of light (modes). This is because MMF has a larger core size than SMF, and different optical properties within this core. Light travelling through the centre moves at a slower rate than other modes. In comparison SMF has a much smaller core (9 microns), with a single path for the light to take. This allows SMF to retain the fidelity of each pulse of light over longer distances when compared with MMF. MMF is typically used for technologies which operate in the 850 nm wavelength, and is available in 2 core sizes 62.5 and 50 microns. SMF is typically used for technologies which operate in the 1210nm and 1550 nm wavelengths, and has a core size of 9 microns. The following is a list of the distances and data rates achievable when using different grades of Multi-mode optical fibre. MMF is typically available in OM1, OM2, OM3, and OM4 types. Please note: You can increase the distance on all MMF for Gigabit to 2 km when propriety cabling is installed. The use of single-mode modules and a mode conditioning cable will enable you to extend the range on OM1 fibre cable up to 550 m.
Gigabit Ethernet describes technologies which transmit Ethernet frames at a rate of 1 gigabit per second. The following are referenced in the description of our Transceiver Modules, so please use the below as a guide. 10 Gigabit Ethernet is 10 times faster than gigabit Ethernet, with a data rate of 10 Gbit/s. The following are referenced in the description of our Transceiver Modules, so please use the below as a guide. Transceiver modules have many uses, but much of their success lies in their inter changeability. An example would be in the event that multiple different optical technologies are used in your network, you can purchase transceiver modules when required, rather than in advance, furthermore these modules can be the specific type (wavelength) required for each link. This achieves 2 things; firstly it lowers the initial costs associated with building your network and then gives you greater flexibility in the future when expanding your network. Transceiver modules also allow you to expand your network over distances of up to 80km, at data rates of up to 100GBase (100 Gigabit/s) when using Single Mode fibre (SMF). This allows you to connect multiple data centres, or office networks together with fibre optic cabling. The optical fibre plugs into a connector on the transceiver module, which then allows for bi-directional communication between the transceiver modules. Another way in which transceiver modules can be used is to connect high speed peripheral devices to your network, such as NAS (Network Attached Storage) boxes or servers. In instances where the server has gigabit or greater networking capabilities, a transceiver module can be installed in a 10/100/1000 megabit switch which has an available high speed module slot. This increases the available bandwidth for the high speed device, and results in increased performance. A Wrist strap or similar personal grounding device designed to stop ESD occurrences. An Antistatic mat or similar which the transceiver can be placed on. Fibre-optic end-face cleaning tools and inspection equipment. A flat head screw driver is require to install a XENPAK transceiver module. Wavelength-division multiplexing (WDM) is a process in which multiple optical carrier signals are combined into one signal (Multiplexing), on the same physical fibre optic cable using several wavelengths with each carrying different data. Coarse Wavelength-division multiplexing (CWDM) and Dense Wavelength-division multiplexing (DWDM) are variants of this technology. CWDM generally offer 8 different wavelengths, each separated by 20 nm, between 1470nm and 1630 nm. In contrast DWDM can have up to 144 different wavelengths, often with only 2 nm spacing, over equivalent wavelengths to CWDM optics. The main advantage of both CWDM and DWDM is that they allow you to expand your networks capacity without the need for physical fibre optic cabling. Before removing or installing a Transceiver Module you must disconnect all cables, leaving these attached can damage the cables, connectors, and the optical interfaces. Please be aware that the regular removal and installation an SFP transceiver can shorten its useful life. For this reason transceivers should not be removed or inserted more often than is required. Furthermore, transceiver modules are sensitive to static, so always ensure that you use an ESD wrist strap or comparable grounding device during both installation and removal. SFP modules can have 3 different types of latching devices which secure the SFP into the module socket, so please determine which latching device your module has before installation or removal of the device. Stage 1: Firstly you should attach your ESD preventive wrist strap to your wrist as well as to the ESD ground connector. A metal surface on your chassis is also acceptable. Stage 2: Next, remove the SFP transceiver module from its packaging. Please note: You shouldn’t remove the optical bore dust plugs yet. Stage 4: Locate the send (TX) and receive (RX) markings. These will allow you to identify the top of the SFP transceiver module. Please note: Certain SFP transceiver modules may represent the TX and RX marking with arrowheads. The direction of these will allow you to determine the send and receive. Stage 5: Align the SFP transceiver module with the module port. Please Note: Devices can have different SFP module socket configurations. It is possible to have either a latch-up or a latch-down orientation. Firstly make sure that you are installing an SFP transceiver module with the correct latch orientation for your device. Stage 6: Insert the SFP Transceiver Module into the socket until you feel the SFP’s connector latch into place. Ensure that you press the SFP firmly into the slot using your thumb. Please note: For those SFP transceiver modules which have an actuator latch, you must press on both the transceiver faceplate and the actuator button to ensure that the transceiver is correctly connected. Stage 7: Verify the SFP transceiver module installation. Attempt to remove the SFP without releasing the latch, if it cannot be removed then it is correctly seated. If it can be removed reinsert the SFP and press harder with your thumb, until you can verify that it is correctly seated. Stage 8: You can now remove the dust plugs from the network interface cable LC connectors. You should save the dust plugs for future use. Stage 9: Inspect and clean the fibre-optic end-faces on the LC connector. Stage 10: You can now remove the dust plugs from the SFP transceiver module’s optical bores. As soon as this has been completed you must attach the network interface cable LC connector to the SFP. 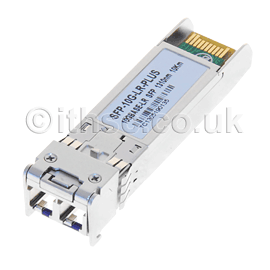 Please note: If you are connecting a 1000BASE-T SFP transceiver module to a copper network you should firstly insert the Category 5 network cable RJ-45 connector into the SFP transceiver module RJ-45 connector. Then Insert the other end of the network cable into an RJ-45 connector on a 1000BASE-T-compatible target device. Stage 11: Check the port status LED, if it turns green the SFP transceiver module has established a link with the target device. If the LED is off please ensure that the target device is powered on before troubleshooting. The LED will turn amber for approximately 30 seconds prior to turning green. Please be aware that SFP transceiver modules are static sensitive so you should always use an ESD wrist strap or similar grounding device when coming into contact with the device. Transceiver modules can also reach high temperatures so may be too hot to be removed with bare hands. Stage 2: Next disconnect the network cable from the SFP transceiver module connector. You should then reinstall the dust plugs on the optical bores and fibre optic cable LC connectors. Mylar Tab Latch: for SFPs with a Mylar Tab Latch, you should first pull the tab in a downward direction until the SFP is released from the socket connector. Then the SFP module can be pulled directly out, ensuring not to twist or pull the Mylar tab. Actuator Button Latch: for SFPs with an Actuator Button Latch, you should gently press the button on the front of the transceiver until it clicks. This should release the SFP transceiver module from the socket connector, following which the SFP transceiver module can be carefully removed from the module slot. This should be done straight, ensuring not to twist or bend the module. Bail Clasp Latch: For SFPs with a Bail Clasp Latch, the latch should be pulled out and down to eject the SFP transceiver module from its socket. Stage 3: The removed SFP transceiver module should now be placed safely in a protective environment such as an antistatic bag. Stage 1: Firstly you should attach your ESD preventive wrist strap to your wrist to prevent ESD occurrences. Stage 4: Using your thumb and forefinger, grip the sides of the GBIC transceiver and carefully align it with the GBIC socket opening on the device. Stage 5: You can now carefully insert the GBIC transceiver module through the socket flap and slide it into the GBIC socket. A click will be heard once the GBIC is locked into the socket. Please ensure that the GBIC is inserted carefully straight into the socket. Please note: you should keep the protective dust plugs in place until making a connection. You should also inspect and clean the SC connector end faces immediately prior to making a connection. Stage 6: The dust plugs from the network interface cable SC connectors can now be removed, ensuring that these are saved for later use. Please be aware that GBIC transceiver modules are static sensitive so you should always use an ESD wrist strap or similar grounding device when coming into contact with the device. Transceiver modules can also reach high temperatures so may be too hot to be removed with bare hands. Stage 1: Disconnect the cable from the GBIC connector. Stage 2: Release the GBIC from the slot by pressing the two plastic tabs located on either side of the GBIC (They must be pressed at the same time). Stage 3: Once released carefully slide the GBIC straight out of its module slot. Stage 4: The GBIC transceiver module should now be placed safely into an antistatic bag. Stage 2: Remove the XENPAK transceiver from its protective packaging, leaving the optical bore dust plugs in place. Stage 3: Verify that the XENPAK transceiver module is the correct model for the intended network. Stage 4: Next, carefully align the XENPAK transceiver module with the slot on the module faceplate. You should now slide the XENPAK into this slot until the faceplate from both the module and the faceplate itself come into contact. Stage 5: You can now tighten the installation screws to secure the XENPAK transceiver module. Stage 6: Remove the dust plugs from the network interface cable SC connectors, ensuring that these are saved for future use. Stage 7: Inspect and clean the SC connector's fibre optic end-faces. Stage 8: Remove the dust plugs from the 10-Gigabit XENPAK transceiver optical bores, ensuring that these are saved for future use. Stage 9: As soon as you have removed the dust plugs you should attach the network interface cable SC connectors to the XENPAK Transceiver Module. Stage 1: Firstly, you should disconnect the network fibre optic cable from the 10-Gigabit XENPAK transceiver connectors, ensuring that the dust plugs are put back on for protection. Stage 2: Next, unscrew the captive installation screws which secure the XENPAK. Stage 3: Slide the module straight out of the XENPAK transceiver module socket, and safely put it in an antistatic bag. Stage 1: You must first remove the X2 Transceiver port cover from the system module faceplate. This can be done using a small flat blade screw driver. Cisco devices will often have 2 arrows on the port cover to show where to insert the screwdriver. If in doubt please consult the documents that came with your device. Once removed the port cover should be saved for later use. Stage 2: Next, you should attach your ESD preventive wrist strap to your wrist to prevent ESD occurrences. Stage 3: Remove the X2 transceiver module from its protective packaging. Stage 4: Verify that the X2 transceiver module is the correct model for the intended network. Stage 5: You can now remove the dust plug from X2 transceiver module optical port, ensuring that this is saved for later use. Stage 6: Next, carefully slide the X2 transceiver module straight into the transceiver socket, located on the system’s module front panel. This will be completed once the EMI gasket flange makes contact with the system module faceplate. To ensure that the X2 is correctly inserted press firmly on the front of the X2 transceiver module. Stage 7: Ensure that the module is correctly latched and seated in the module socket. Gently pull on the transceiver by holding the left and right sides of the module simultaneously, if it doesn’t move then it is correctly seated. If it does pull free then it is incorrectly seated, and you should reinsert it using slightly more force with your thumb on the front of the X2 transceiver module. Repeat the process if necessary, until correctly inserted. Stage 8: You can now reattach the dust plug to the optical bore until you are ready to connect the transceiver. Stage 9a: For optical X2 Transceivers you should now remove the dust plugs from the SC connectors, clean the SC connectors fibre optic face ends, and remove the dust plugs from optical bores. As soon as this has been completed you should attach the network interface cable SC connectors to the X2 transceiver module. Stage 9b: If you are installing a CX4 X2 Transceiver you should plug the infiniBand cable connector into the CX4 X2 transceiver module connector, making sure that it is correctly aligned. You must now carefully guide the InfiniBand network cable through the cable management brackets on your system. This must be done for InfiniBand cables due to their weight, as without adequate support the cables can sag or skew. Sagging and skewing can lead to misalignment and therefore a poor connection between the cable and the CX4 X2 transceiver. Stage 1: Firstly, disconnect the network interface cable from the X2 transceiver module. For optical X2 transceivers you should also reattach any dust plugs. Stage 2: To remove the X2 transceiver module you must lightly grip the EMI gasket flange and gently press it against the system module front panel. You should simultaneously pull the latching sleeve out in order to release the transceiver from the socket connector. The latching sleeve should only be released as you feel the transceiver unlatch. Stage 3: The X2 transceiver module should now slide out of the socket straight, and be placed safely in an antistatic bag. Stage 4: Replace the socket cover over the empty socket opening on your device if applicable. Stage 2: Remove the XFP transceiver from its protective packaging, leaving the optical bore dust plugs in place. Stage 3: Verify that the XFP transceiver module is the correct model for the intended network. Stage 4: Align the XFP transceiver module in front of the XFP socket opening, slide the module half way straight into the XFP transceiver socket. Stage 5: Remove the optical bore dust plug from the XFP, ensuring that this is saved for later use. Stage 6: The bail clasp should be pivoted upwards ensuring that it is parallel with the body of the XFP transceiver module. Stage 7: The XFP transceiver module can now be fully inserted into the socket connector. Stage 8: The Bail clasp should now be pivoted downwards, to latch the XFP transceiver module into its socket. Please ensure that the latch is fully engaged. Stage 9: The optical bore dust plugs should now be reattached, until the cable is ready to be attached. Stage 10: Finally, remove the dust plugs from the LC connectors, ensuring that these are saved for later use. Inspect and clean the fibre optic end faces, then remove the dust plugs from the XFP transceiver module’s optical bores. Once this is done you should attach the network interface cable LC connectors to the XFP transceiver module. Stage 1: Firstly, disconnect the network interface cable from the XFP transceiver module, reattaching the dust plug in the fibre optic cable LC connector. Stage 2: Release the XFP transceiver module from its socket by pivoting the bail clasp. Stage 3: The XFP will now slide out of its socket, ensure that you pivot the bail clasp down once it has been removed, and reinstall the dust plugs on the XFP transceiver module’s optical bores. Once removed place into an antistatic bag for protection. This is extensively used to refer to modular connectors with Ethernet-type wiring pin outs, these take the form of 8 position 8 contact, and so are more accurately known as 8P8C connectors. In relation to transceiver modules this type of connector is most likely to be found on those designed for Cat 5 or better copper wire. Often abbreviated to Cat 5, this is a twisted pair copper cable used for carrying data signals. Twisted pair cabling is used to prevent electromagnetic interference (EMI) from external sources, and is the result of twisting the forward and return conductors of a single circuit together. 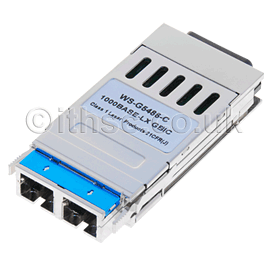 Cat 5 is most commonly used for fast Ethernet such as 100BASE-TX and 1000Base-T, and mostly connected using an RJ-45 (8P8C) connector. In terms of transceiver modules, Cat 5 cable is typically used over relatively short distances. Cat 5 cable comes is available in 2 types: Unshielded Twisted Pair (UTP), commonly used in the USA, and Screened Twisted Pair (SCTP), which has additional shielding to protect against external interference. Cat 5 cables are either solid (best for long distances), or stranded (greater flexibility). Cat 5 cables can support either 10 or 100 Mbit/s Ethernet, with a capability of up to 100 MHz. An enhanced version Cat 5 e cable is available, which provides Gigabit Ethernet (1000 Mbit/s). Cat 6 cable supports 10 Gigabit Ethernet, and can operate at up to 250 Mhz. This increase in data rate is achieved by a structural difference in the cable. A longitudinal separator is present which can isolate each of the four pairs of twisted wires from each other. This reduces crosstalk, thereby allowing for faster data rates, and greater bandwidth. Cat 7 cable further enhances the crosstalk reduction features of Cat6 cable, by adding shielding for individual wire pairs as well as the cable itself. Cat 7 cable allows 10 Gigabit Ethernet over 100 metres of copper cabling. These connector types are commonly found on optical transceiver modules. Optical fibre connectors are used to terminate the end of optical fibres, thereby increasing the speed and ease of connection/disconnection to the device. Subscriber Connectors (SC) are capable of high packing density due to their square shape, which coupled with the reduction in the probability of fibre endface contact damage as a result of their push-pull design, resulted in their frequent use in the previous generation of networking technology such as GBICs. SC connectors have now largely been replaced by Lucent Connectors (LC), due to their smaller size and therefore higher packing density. Using LC connectors a higher number of fibres per rack unit are possible, when compared to SC connectors. Due to their smaller size LC connectors are often found on SFP transceiver modules. Twinaxial cabling is widely used where a high data rate is required over very short distances (1-7 metres). Twinax can be used for SFP+ Direct Attach, a copper 10 Gigabit Ethernet solution where the cable assembly connects directly into the SFP+ housing. This is available in both active and passive forms. Active twinax cable contains active electronic components which act to improve signal quality; the passive Twinax is a normal wire lacking these active components. Passive Twinax cables are typically less than 5 metres, while active tend to be used in cables over 5 metres. The SFP+ Direct Attach solution can offer considerably lower transceiver latency when compared with other 10GBase-T (Cat6-Cat7) solutions. For this reason the SFP+ Direct Attach is believed to be the optimum solution for distances of 10 metres. This is a communication system in which both connected devices can communicate with each other in both directions. There are 2 variations: Half-duplex, and Full-Duplex. A half-duplex (HDX) system allows communications in both directions but not simultaneously. For example, the transceiver which is receiving data must wait for the transceiver which is transmitting data to finish before it can transmit. A full-duplex (FDX) system allows communications in both directions simultaneously. PC is used as an abbreviation for “physical contact” and indicates that the connector uses a physical contact polish on the fibre and ferrule end. This is done to ensure that when the fibres are connected only the fibre cores come into contact, giving less insertion loss. Insertion loss refers to the loss of signal power when inserting a device. There are higher grades of polish which further decrease insertion loss, Super physical contact (SPC), and ultra physical contact (UPC). These will be denoted after the connector type if applicable. Digital optical monitoring (DOM) is a feature which allows you to monitor many parameters of the transceiver module in real-time. DOM allows you to monitor the TX (transmit) and RX (receive) of the module, as well as input/output power, temperature, and voltage. Network administrators can then check and ensure that the module is functioning correctly. These are enhanced transceiver modules which have been designed for greater durability, and can operate under more extreme conditions. Rugged transceivers may feature enhanced ESD protection, and extended operating temperature range. Rugged transceiver modules often have "-RGD" in their product number to assist in their identification. Fibre optics have many advantages over copper cabling when it comes to their use in networking applications. Firstly fibre is smaller in size, and more durable than the equivalent copper cable. This makes it easier to install and more compact, so will take up less room if space is an issue. Fibre cabling also supports longer distances than copper cable, for example Cat 5e, 6, and 7 are limited to just 100 metres, while OM3+ fibre cable supports distances of up to 100 km (SMF). Transceiver modules with different form factors can be connected to each other, provided that the media type is the same. For example you could connect a 1000Base-SX GBIC to a 1000Base-SX SFP using an LC/SC cable. For optical transceivers the wavelength is defined by the media type, so two different form factors with the same media type would be compatible. LC/SC cables are commonly available, and comprise an SC connector at one end, and an LC connector at the other.